This decadent European chocolate bar has been infused with Ghost pepper powder as well as essential oils of sweet orange and clove, and cinnamon, creating a delicious fiery treat. Ingredients: Milk chocolate (sugar, cocoa butter, whole milk powder, cocoa mass 33.6%, emulsifier-soya lecithin, natural vanilla), essential oil of sweet orange, cinnamon, essential oil of clove, Ghost pepper powder (0.1%). This is a reasonable-quality chocolate with a formidable amount of spice. I find the spice level just right but my wife couldn't eat it as she found it intolerably spicy. It's a chocolate bar so it's sweet but it also packs a ghost-pepper spice kick. 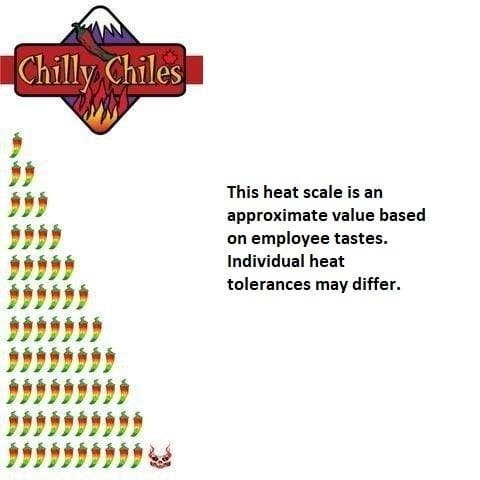 I suggest that it's most definitely worthy of a spot on any chile-head's menu. Perfect combination of spice and sweetness. The chocolate is just hot enough to get a little tingle in your mouth and the combination of flavors makes it an enjoyable treat. Highly recommended.